The Nebula Capsule is Anker’s first offering in the pico projector market. The projector is, quite literally, the size of a 12 oz soda can give or take a few millimeters and doesn’t weigh much more all things considered—a plain ol’ Coke can weighs around 400 grams whereas the Nebula weighs 470 grams. Inside the can-shaped profile, you’ll find a compact DLP projector capable of putting out 100 ANSI lumens at an 854*480 pixel resolution. For a frame of reference, 100 ANSI lumens is about 1/15th to 1/20th the brightness of a full-size home projector and the resolution is standard definition (480p) but with extra width to make it 16:9—we’ll talk more about the brightness and resolution later in the review. In addition to the critical part—you know the bright moving picture bit—there’s a 360-degree speaker design that gives the projector a definite Bluetooth speaker appearance, and the whole thing is powered by Android 7.1.2. The little projector includes 8GB of internal storage (roughly 5GB of which is used up by Android and the stock apps). The 5200 mAh battery charges in around two hours with the included Quick Charge 2.0 charger and offers 4 hours of playback when in projector mode and 30 hours of playback when in Bluetooth speaker mode. The Nebula Capsule projects out of a small opening in the side of the can, roughly the size of a quarter. There is no built-in lens cover nor removable cover. When not in use the projector should be stored in the included storage bag. Next to the lens, there is a small gear-wheel used for focus adjustment (no automatic focus adjustment, alas, although there is auto keystoning). The top of the projector is a directional pad that offers simple interactions with the projector. The only other visible ports or points of interest are found on the rear and bottom of the projector body. On the rear, you’ll find a small IR port used for the remote control. 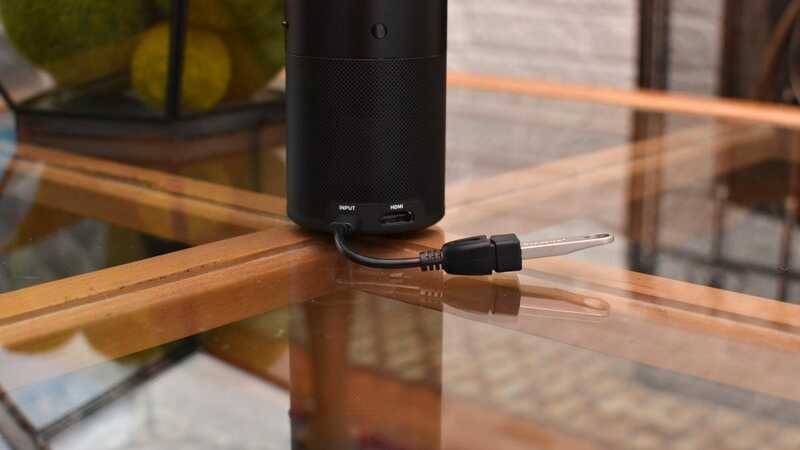 At the lower rear, there is an “Input” port, which functions both as a charging port and as an input for USB storage (which you can connect using the included USB to Micro USB OTG cable). Beside the Input port is an HDMI port. 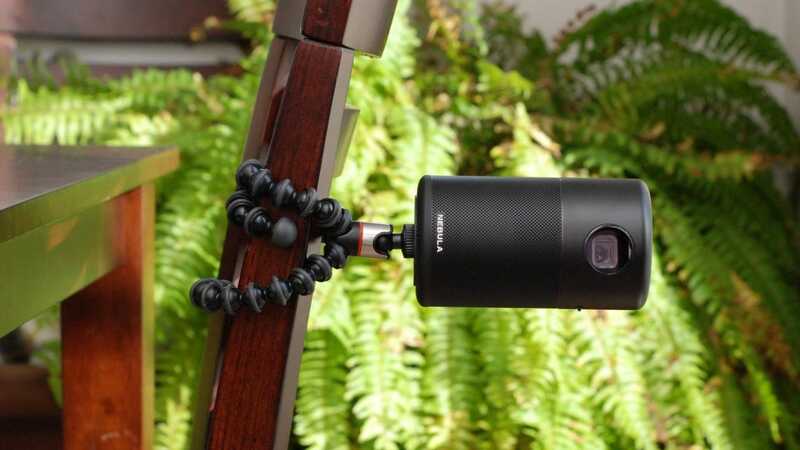 On the bottom of the cylinder is a standard tripod mounting point which makes it dead simple to put the Nebula Capsule on a regular photography tripod or any other suitably sturdy device (like a Joby GorillaPod or other flexible tripod) with a standard screw. There are three ways to interact with the projector. The first way is to use the circular control pad on the top of the device. There you can press the parallel arrow button at the top of the pad to switch between projector and speaker mode, the +/- buttons on the left and right side to adjust the volume, and the power button to turn the device on and off (as well as, thoughtfully, check the battery life by tapping the button swiftly wherein the projector will turn on for 3 seconds and project a battery meter on a nearby surface). Clearly, the directional pad is intended more for the actions performed when turning the device on and adjusting the volume without much fuss. Beyond that, it’s quite limited. The second way you can interact with the Capsule is the included IR remote. 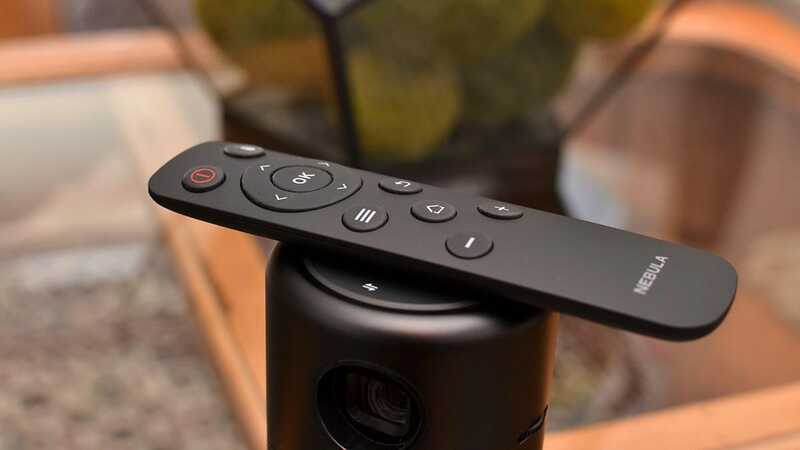 The remote worked as well as any other IR remote and included a pretty standard media player interface that will be familiar to anyone who has used an Apple TV or Fire TV. It sports the usual suspects: a home button, back button, directional pad, and OK button, as well as a menu and power button. In the upper right corner there’s even a “Mouse” button to pull up an on-screen cursor and move it around, mouse-like, using the directional pad should the need arise. You might be thinking “When would I need a mouse on a smart projector?”—we’ll get to that later on in the review. Although the remote’s buttons and functions worked perfectly fine, we found the placement of the IR port on the projector to be problematic. If you’re not behind the projector, the remote is hit or miss. Given that you often place a projector behind yourself to get the maximum screen size and, in the case of tiny projectors like this, you might even lay it on the floor to shine up at the ceiling, a remote that only works when you’re more-or-less directly behind the projector with a clean line of sight is a big pain. An RF or Bluetooth remote would fix this issue. Thankfully, there’s the last method of interacting with the projector that largely makes up for the finicky physical remote interface. 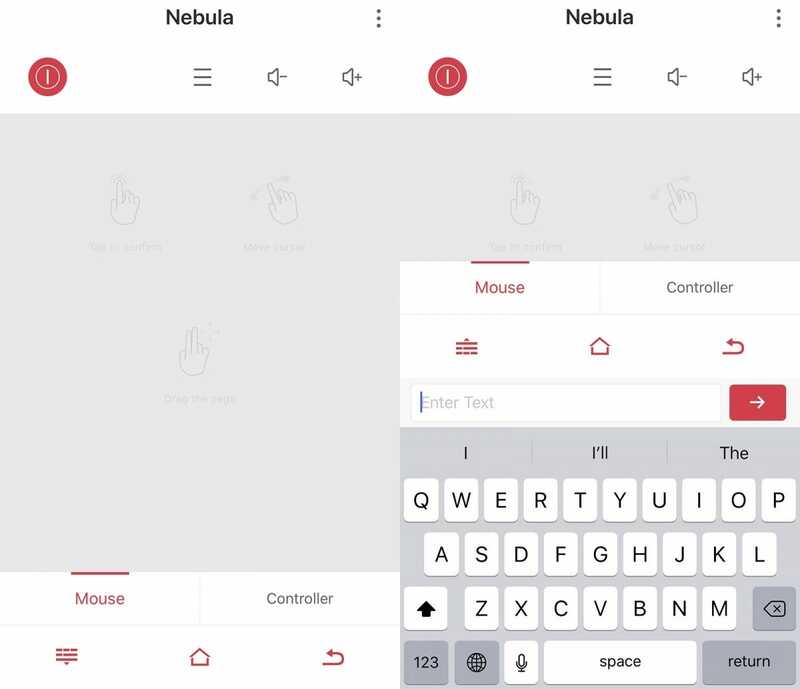 The Nebula Connect app you can download through the App Store and Play Store turns your iOS or Android device into a remote control for the projector. The app works well enough and, for the most part, just turns your phone into a giant touchpad with a few buttons. If nothing else it makes typing in your streaming video logins, thanks to a pop-up keyboard, so much easier. While you can set up the device using the physical remote because the app connects to the projector via Bluetooth you don’t even need to suffer through using the remote with the on-screen keyboard to connect the projector to your Wi-Fi. Just download the app right away, pair it with the projector, and use the app for the rest of the setup process. That process, by the way, is trivial and if you’ve ever set up a new phone it’s an almost identical process with way less hassle. Knowing what’s in the box and how you can control the projector is all well and good but what’s a projector without some material to blast out of it on to the wall, right? Thankfully, you can play quite a bit of stuff on the Nebula Capsule. If you want to bring your own movies and images, it’s easy to do so with the USB input via the OTG cable (for the unfamiliar, it’s just a simple USB A to micro USB adapter). You can slideshow the usual suspects: JPEG, BMP, GIF, PNG, and TIF. You can play H.264, H.265, and MPEG4 video, as well as MP3, ACC, FLAC, and other audio formats in speaker mode—for the specifics of the different compatible formats, check out the Specs section here. In our testing, it was no different than plugging in an OTG cable and a flash drive to an Android phone or tablet. Loading up the files wasn’t an issue at all. While most people won’t, in the comfort of their own home, fuss around with loading up a flash drive full of media, if you want to use the projector at a remote location like a campsite or even in the park where you can’t rely on stable internet to stream (or don’t want to deal with bringing along an HDMI-based device which will require its own power source), the ol’ flash drive of ripped movies is a real lifesaver and we’re glad the option is there. That said, it’s a bit of a mystery as to why they didn’t include a micro SD card slot. With the incredibly low cost of micro SD cards these days, it would be really awesome to pop in a card loaded up with movies instead of messing with a cable adapter. It would also allow for simultaneous playback and charging. Also on the physical port front, the HDMI port works great for whatever you want to throw at it: you can plug your Xbox into it, you can plug your Bluray player into it, you can even plug streaming media devices like a Chromecast or Roku Stick. 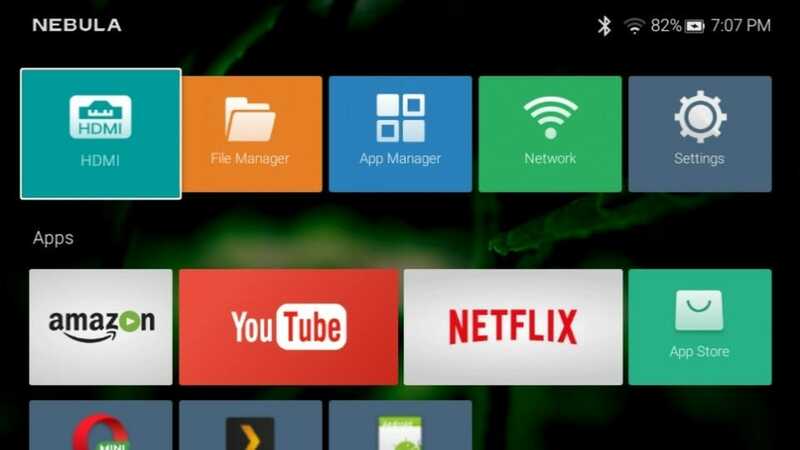 Finally, because the device is running Android instead of just dumbly passing along whatever is on the USB or HDMI input, you can, naturally, run streaming apps. This includes all the crowd favorites like YouTube, Netflix, Hulu, and Amazon Instant Video. While all of these popular services worked well enough on the Capsule, there are some definite quirks in how the apps operate which brings us to a nice point to transition into our experiences with the Capsule in real world use. By default, instead, it has an app delivery system you’ve likely never even heard of: Aptoide. The ten-second explainer there is Aptoide is a specialized app store that allows for the creation of customized stores, that function like Linux app repositories. In this way Anker is able to curate their own little appstore. In theory that sounds like a cool way to keep the user experience tight, clean, and controlled. 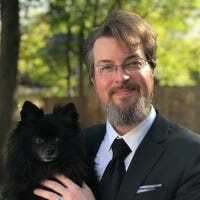 In practice, the end result is you sometimes get stuck with the mobile (instead of TV) version of streaming apps which means they are optimized for touch screen input, not remote input. The YouTube app wasn’t too annoying to use and Plex automatically asked you if you wanted the TV interface as soon as it sensed you were clicking around with a remote (blessings on the Plex app designers for that). 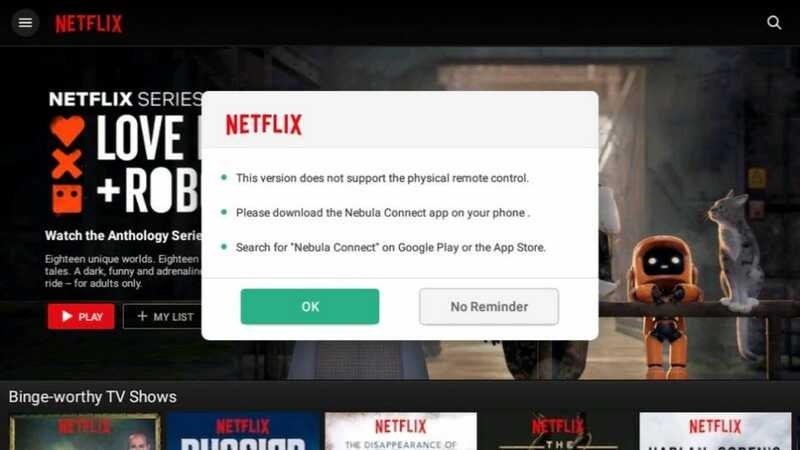 The Netflix app was a giant headache, however, and even with using the Nebula app on your phone to control the interface it was still irritating. The only positive thing we can say about that is all the apps that were finicky at least came with warnings suggesting that you should skip using the physical remote and use the phone app instead. If you get frustrated enough with a specific app, like Netflix, it’s really simple to plug in a Chromecast or other small streaming device though (even if that takes away from the magic of the soda-can-design a bit). All that said, it’s a bit puzzling why they didn’t simply go with Android TV and, in doing so, erase all their interface issues in one go. That complaint aside (which is, in the grand scheme of our using the device, pretty minor) we really liked the Capsule. 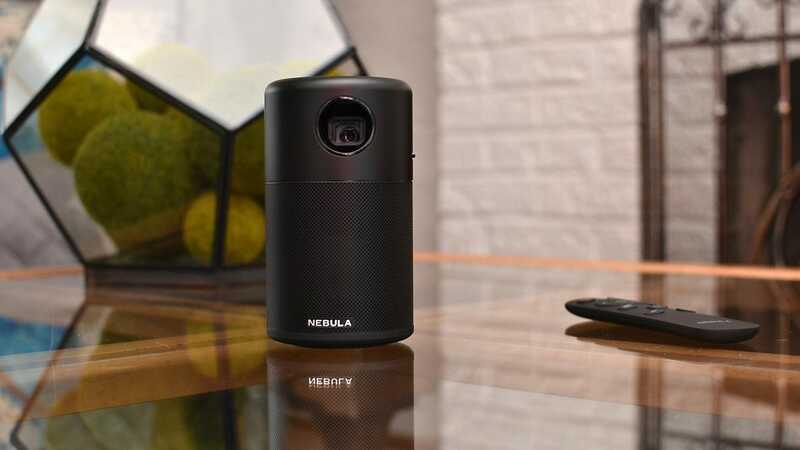 Anything else you can complain about isn’t a shortcoming of the Nebula Capsule, it’s a shortcoming of mini/pico projectors as a whole product niche. Before anything else, let’s address the resolution. The Capsule’s 480p 16:9 resolution isn’t as big a deal as you might think. Yes, if you’re up close to the wall studying the image, it is definitely not 4K. Practically speaking, however, under the conditions most people will use the Capsule, that doesn’t matter. At no point in showing the Capsule off to people did anyone say “What the hell is this? Is this standard def? !” and even though we knew it was very low resolution compared to modern displays, we never noticed in real-world use either. We had a similar opinion about the brightness. 100 ANSI lumens is not really bright in the world of full-size premium home projectors. It is, however, really bright for a projector that fits in your hand. The Capsule isn’t going to fill an actual movie theater with blindingly bright light, but that’s not the point of the product. The point of the product is the ability to bring a projector wherever and whenever you want. You can pull it out of your bag at a friend’s house. You can carry it out to your deck to shine on the wall of the house without breaking a sweat (or busting out a box of extensions cords and cables). You can shine it on your bedroom ceiling for the absolute laziest The Office marathon ever. Maybe one day we’ll live in a future where you can get an eye-searing 2,000 ANSI lumens out of a soda can form factor, but that’s not today and that’s OK. The same can be said for the sound. It sounds exactly like you’d expect a soda-can-size Bluetooth speaker to sound (especially if you had to cut down the internal size to make room for a projector). In fact, it probably sounds better than what you’re imagining, even. The bass is weak, to be expected, but the volume is surprisingly loud. So loud that during our testing we rarely turned it up past around 30-40 percent. Given the distance you’ll typically be using this at, it’s plenty loud and clear. 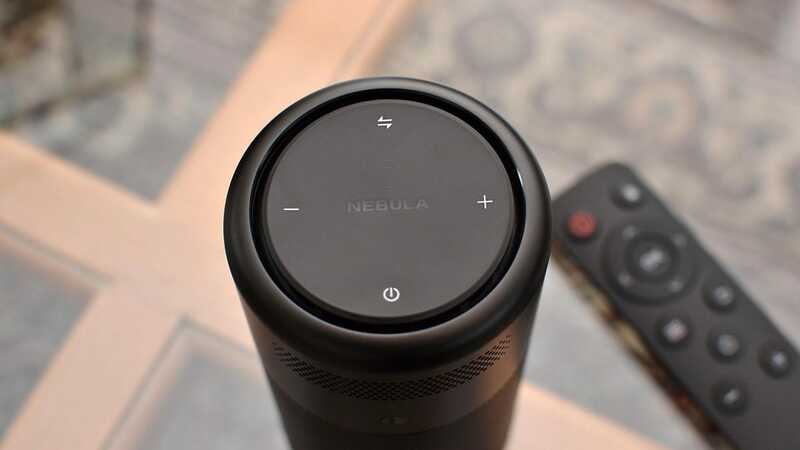 The answer to the question “Should you buy the Nebula?” is more complicated than you might think because there’s a new version of the Nebula projector right on the horizon. Yet, despite that, the original Nebula we’ve taken such a close look at is still a really good value. 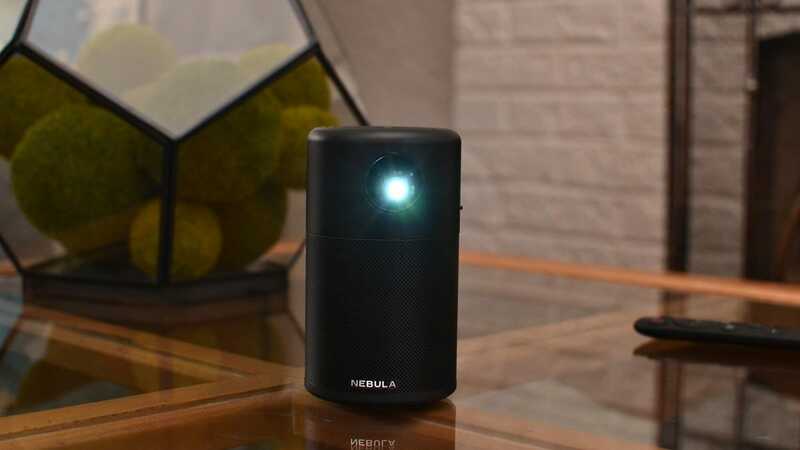 The Nebula costs $299.99 and, while not the cheapest projector in the pico/mini projector market, is a fantastic value. For three hundred bucks you’re not going to get more projector and more features in a smaller package. The Nebula II is available for pre-order for a few more days and will begin shipping in June. It’s twice as expensive at $599.99 but, in fairness, does sport some big improvements including doubling the brightness to 200 ANSI lumens, upping the resolution to 720p, adding in USB-C power charging as well as a separate USB A port for a flash drive, swapping out plain Android for Android TV, autofocus adjustment, and baking in Chromecast functionality. That is, by no means, a paltry number of upgrades. Despite the pile of upgrades you get with the Nebula II, we still feel confident recommending the Nebula. If you want an incredibly competent pico projector for $300 or less, it’s tough to beat. Given that you’ll likely see it on sale soon thanks to the upcoming release of its successor, it’ll be an even better deal on sale for $250. If anything about it (like the lower resolution or the lack of Chromecast support) is a dealbreaker, however, then that just means you’re a prime candidate for the only pico projector currently in line to dethrone it, the Nebula II. This Christmas is the perfect time for you to buy your kids a robot toy for them to enjoy and maybe learn a few things from. Here’s a look at some of the best robot toys out there for kids of all ages.